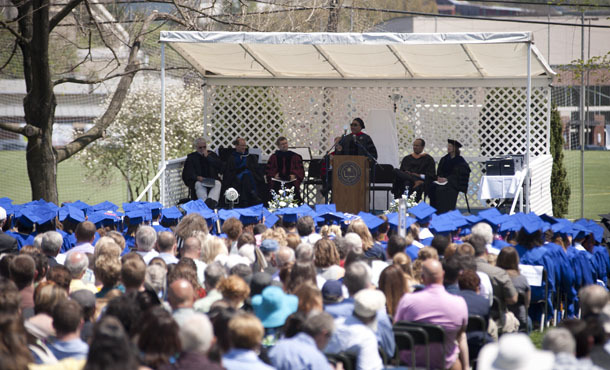 A Nobel Peace Prize winner gave those words of advice to Eastern Mennonite University’s graduates Sunday afternoon. Leymah Gbowee (pronounced bowie) — a 2007 EMU alumna and winner of the 2011 Nobel Peace Prize — addressed a crowd of 467 graduates, along with their friends, family members and EMU faculty during the university’s 96th commencement Sunday on the campus lawn. Gbowee, whose son Joshua was a member of the graduating class, encouraged graduates to reach for their dreams but also to learn how to stay in the moment. “Embracing the present allows us to see practical ways to make a difference even when our lives are in conditions of pain,” she said. Gbowee, who is Liberian, won the Nobel Prize for her contributions to a women’s peace movement that helped bring about the end of the second Liberian Civil War in 2003. She recalled a woman from her country who had lost two sons to civil wars. The woman came to a protest and got involved because she didn’t want others to lose their sons. “Her present was full of heartaches and pains but she chose to embrace it for a better future for Liberia,” Gbowee said. Gbowee was a poor mother of two and only had a high school diploma, but decided she wouldn’t let her income or social status, or her lack of a college education, limit her. “I never set out to be a global women’s rights activist,” Gbowee said. She just wanted to make a difference. Among her efforts was an initiative working with young girls in Liberia. Many young people in her community had sexual relations early in life and wound up pregnant before they had a chance to finish school, she said. One day Gbowee invited four girls from that environment into her living room. She was thrilled when, many years later, one graduated from high school without having had children of her own. “That was like a Nobel Peace Prize for me,” Gbowee said. She encouraged EMU graduates to not let others’ perceptions of what they will do after graduation stop them. All one needs is a “crazy idea or concern and a whole bunch of enthusiasm,” to make a difference in people’s lives, Gbowee said. Having one friend who helps can be a big plus, she said, citing the examples of Susan B. Anthony and Elizabeth Cady Stanton. Cristian Quezada, 33, a Santiago, Chile, native who received a master’s degree in conflict transformation with an emphasis in restorative justice and trauma healing, said it was an “immense privilege” to hear Gbowee. Mariana Lorenzana, 52, is a school teacher at Smithland Elementary in Harrisonburg. Originally from Honduras, Lorenzana said she wanted to be an example to the Latino community and her children. “It’s not easy, but it’s not impossible,” she said, after attaining her master’s degree in education. It took her three years of going to college part-time to finish, said Lorenzana, who has been teaching for 20 years.